How could it have been more vigorously brought to life? e take it for granted that science fiction has been produced, for the past twenty and thirty years, in the legacy of Star Wars and Star Trek. Cosmic fleets here, teleportation there; psychokinetic castes and universes sprung up from string theory both with their places in documentary textbooks. Most fantasy inhabits the domain of JRR Tolkien — as everybody knows — and Dungeons & Dragons popularized the twin triplets, elf-dwarf-man and warrior-mage-rogue. But only recently have I realized how inarguably Peter Jackson's Lord of the Rings films, nearly ten years ago, now, settled contemporary tastes for legend. You only need glance at World of Warcraft or Elder Scrolls IV: Oblivion. Good is solemn, pastoral, and conflicted; evil is dusky, stalagmitic, and mass-produced. Representatives from either Blizzard Entertainment or Bethesda Softworks, however, never touted their game as "dark heroic fantasy" capable of "becoming more than just typical fantasy." BioWare's Dragon Age: Origins, weaving an ancient and mystical land with lapidary histories and fables, shows the skillful enthusiasm directed by Lead Writer David Gaider and Lead Designer Mike Laidlaw. But it is devotedly Tolkienesque and unwaveringly P. Jacksonian, not quite as billed. And by replicating gameplay more than originating it, Dragon Age rests heavily on its story — sometimes compelling, sometimes trite tales told dully. Painstakingly scripted verbal interactions form a constellation of events, driving the plot this way or that.Traditional kingdoms make a home of the continent Thedos. The reign of elves, fantasy's Romans, is erstwhile, the lithe people long since deracinated and scattered. Humans, like Gauls and Vikings, agitate and expand. Dwarves cross Mesopotamia with Egypt and China, marvelous in their reclusion. None is safe from the Blight, a recurring invasion of darkspawn — orcs and goblins by any other name — and the poison fruit of mortal conceit. Ad hoc heroes, Grey Wardens, combat the scourge with any army they can muster, including a player's character who — from one of six unique backgrounds — stumbles into the life of vigilantism. BioWare's roleplaying trademarks are evident from the first moments of an introductory quest. Painstakingly scripted verbal interactions form a constellation of events, driving the plot this way or that depending on a player's choices and demeanor. Moral divisions, tactical selections, offhand remarks — words and actions matter, consequences weightier as one advances. Fellowships and romances, BioWare desiderata, are also to be had. Eight NPCs — nine, via downloadable content — may join the player's character and three of them can join a party, allowing one more active participant than in previous titles. But this time, the sum of parts finds no gestalt. Companions, however distinct, don't effortlessly attract as did the leads in Knights of the Old Republic and Mass Effect. It could be the difficulty in making archaic language evocative; 'tis and mayhap, bardolatry that got the developers of Two Worlds heckled, mix with anachronisms. Some performances, too, flag: the voice actress playing a cherubic rogue is an unconfident francophone, repeatedly slipping into an English accent and spoiling her delivery. Romance, an intimate and gradual pursuit in previous BioWare titles, consummates abruptly — and, with the leverage of gifts and necking in front of comrades, a little tawdrily. Nothing much about the premise or its dramatization is notably dark or controversial (blood-flecked visuals don't count). Clubfooted pacing occasionally matches tiny steps in exploration with shambling dialogue, including long conversations between NPCs. A player may well be left indifferent to the game's most valuable elements. All that splendor gone to waste: the game suggests — but doesn't much manifest — enormity or wilderness.Leveling and combat, on the other hand, both have sound mechanics demonstrating lessons learned. Player characters may specialize within their chosen class, forgoing mandatory weapon proficiencies for gambits and feats that offer a little more fun and variety. Although superfluous weapons and equipment do tend to accumulate in party coffers, item classes aren't simply assigned to an arbitrary model series as in Mass Effect — BioWare's writers having been given a chance to supply each class with a little color text. Crafting, such as herbalism and poison-making, while unintuitive and inconvenient, can be managed easily enough. Dragon Age, contending with sandbox games and MMOs, appears small at times. The adventuresome will often find themselves hemmed into narrow paths that suggest — but never manifest — enormity or wilderness. A certain linearity, too, countervails the plain replay value found in half a dozen player characters who would perceive and influence the world around them differently. Where the game becomes exceptional — where I finally found satisfaction expected of a BioWare release — is where it is sparing in narration, silent and implicative. The Fade, a sanguine, fiery netherworld, introduces puzzles and a shape-shifting mechanic with a classical, apothegmatic whimsy absent from the rest of the game. 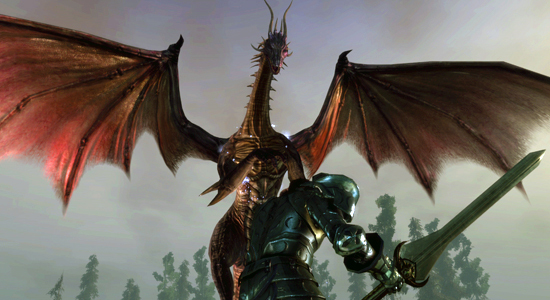 Dungeon-crawling, too, provides a sure thrill, so a pity Dragon Age doesn't offer more of it. Tomes, atlases, and wikis won't widely entertain on their own. A cause for sobriety among imaginative writers, those dreamy architects of faraway places: no amount of loving detail for a place, its people, or its fables can redeem a jejune presentation. But to provoke, to move — mere words limn worlds. How Dragon Age could have been brought more vigorously to life should be an earnest question of BioWare's. I was thinking of holding off on this game and it looks like your review validates that. The gameplay looks pretty standard, graphics dissapointing (at least for a Bioware game) and if it really is 80 hours long as people say... well I'd probably rather finish all these other RPGs I've got building up. LOVE IT! Your review is spot on. This game kills it. EVERYONE with a 360 should be running (yes, running) to the store to get Dragon Age. Great review. I was on the fence about getting this game. Now I will just wait and ask for it for X-mas.